New Hampshire is home to eight species of bats, and six have been identified as "of conservation concern." This web site includes information on diet, population, range, behavior, climate change and threats, legal status and protection, reasons for hope, and how you can help. Discover the bats of Delaware; the species we have, how to attract or safely evict them, get information about White-nose Syndrome, and find out what the state is doing for bats. You can help bats by become a Bat Spotter. This series of short articles provide information on bat wings, echolocation, caves, fact and fiction, and more. contains information about White-nose Syndrome. Lubee Bat Conservancy focuses its efforts on plant-visiting “fruit and nectar” bats because they are vulnerable to extinction yet vital to the world’s rainforests and deserts and to the economies of developing countries. Bats have received a bad reputation as being blood suckers, carriers of disease and "flying rats," All of these descriptions are wrong and fail to grasp the beauty, wonder and benefits of bats. There are over 40 species of bats in the United States and all of them are beneficial to people. 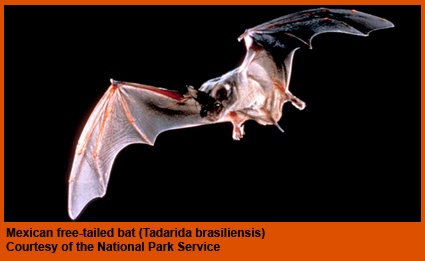 Most bats feed on insect pests and some bats even help in pollination. Scientists study bats to further expand our understanding of flight, sound, sonar and evolutionary biology. Even bat guano is an important resource and fertilizer! So before you tell scary stories about bats, remember how much they help make our lives better every day! The Organization for Bat Conservation’s mission is to preserve bats and their habitats through education, collaboration, and research. The web site has useful information about bats, bat conservation, fun facts, kids’ and teachers’ pages, and more. supporting research and other projects that protect bat populations threatened by white nose syndrome through public awareness, funding, and captive bat management. Additionally, the Save Lucy Campaign will support research and other projects designed to protect bat populations threatened by white nose syndrome through public awareness and fundraising. Check out the information about echolocation, the science of bats, White Nose Snydrome, and more. This web site includes information, pictures, specimens, sounds and classification. For links with information about White-Nose Syndrome, CLICK HERE. For links with information about caves and karst topography, CLICK HERE. For links of videos, CLICK HERE.